On April 8 2010, Winmate upgrades the 10.4 inch SVGA Panel PC designed around an integrated Intel ATOM-based main board. The 1.6GHz N270 processor & 945 GSE chipset is energy efficient with ultra slim features. The benefits of fanless mechanical design makes it very suitable for rugged and limited space environments. The open frame range offers a versatile and stable long term platform for OEM's and System Integrators. The Panel PC has I/O ports, including USB, COM, and Gigabit Ethernet to connect a wide range of peripherals and networks. The additional feature of this Panel PC is an embedded PCMCIA slot on the main board. This enables support of wireless 3G environments. Furthermore, the PCMCIA interface can also be used as an expansion slot. Additional cards such as USB, TV, and COM port or Bluetooth increases the capability of this Panel PC. 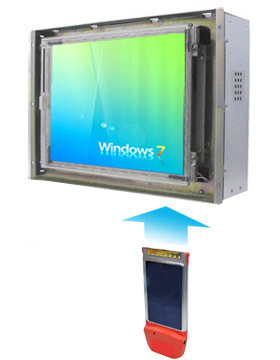 With Windows 7 OS integrated touch solution, this Panel PC can be used like an iphone with superior touch features.